When I shot the old railroad engines and cars a few weeks ago, I pulled out a 105 mm macro lens, one that allows extreme close-up photography, and used it for some of my shots of small rusty objects. When I got home however, I decided to take a few shots of some of the blooming flowers in the yard. 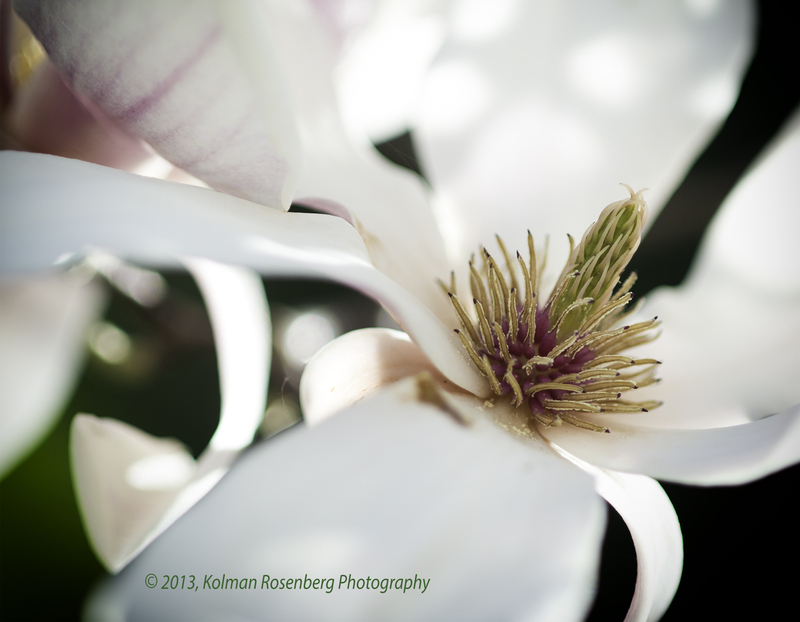 The first shot is of the center portion of a magnolia blossom. My magnolia tree is in a corner of the backyard near the corner of the house. It is largely out of view of any of the windows. Every year the magnolia blooms quickly and drops it’s pedals, often before I even realize it has happened and I miss it. This year was different! I did manage to capture some images. Macro shots like this usually result in very shallow depth of field, meaning there is a very small area of the photo which is in focus. 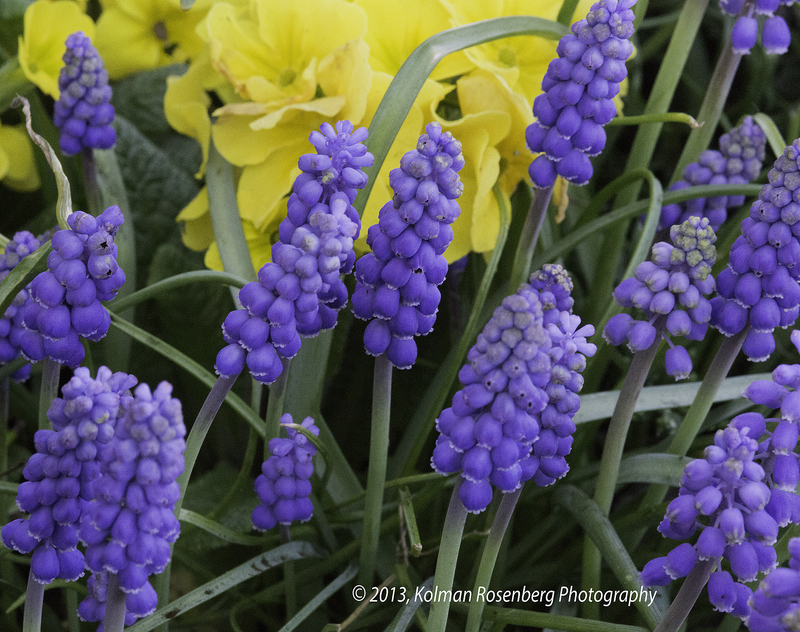 The grape hyacinths were also in full bloom and I captured a few shots of these also. The entire flower in the photo above is only about an inch and a half tall. Once again, very shallow depth of field! 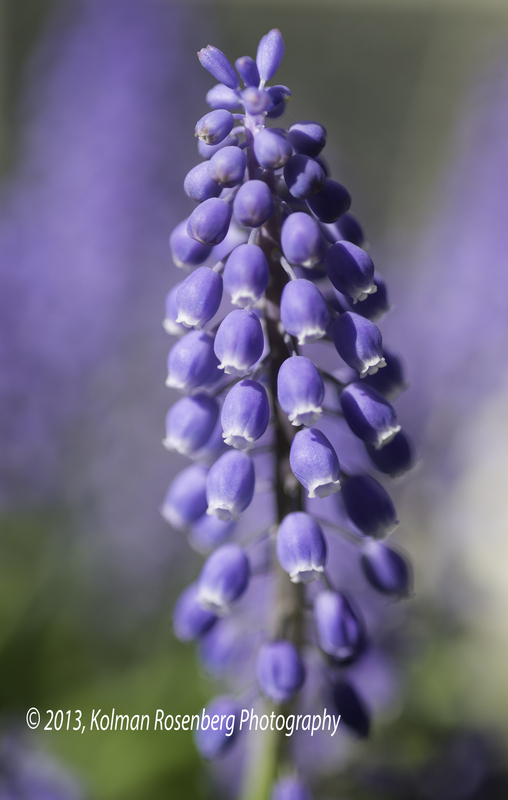 The last shot is another of the grape hyacinths but from a little more distance and showing more of the flowers. Tonight a frost is predicted and many of the still existing blooms will probably be damaged! I’m glad I got them when I did! This entry was posted in Uncategorized and tagged close-up, Depth of Field, dof, flora, flower, grape, hyacinth, Lens, macro, magnolia, purple, yellow. Bookmark the permalink. Nice blog. I’m in awe. Hey Jack! Thanks! We don’t have our flowers for very long like you do on the “Left Coast”! The white magnolia blossom is my favorite. Very beautiful. Good job! Thank you Linnie! Not my usual type of subject or shooting style but people seem to like these! Oh thanks Nancy! Lensbaby shots are on the agenda! You are another inspiration for these types of shots for me! Thanks! Lovely! Especialy magnolia flower. Would you mind if I paint it? Thank you for posting, this is a feast for our eyes! Thank you! I’d be honored if you paint it! Glad you loke it!